The definition of the word Cosmos is something along the lines of ‘a harmonious universe’, a kind of orderly system that the Greeks believed in. 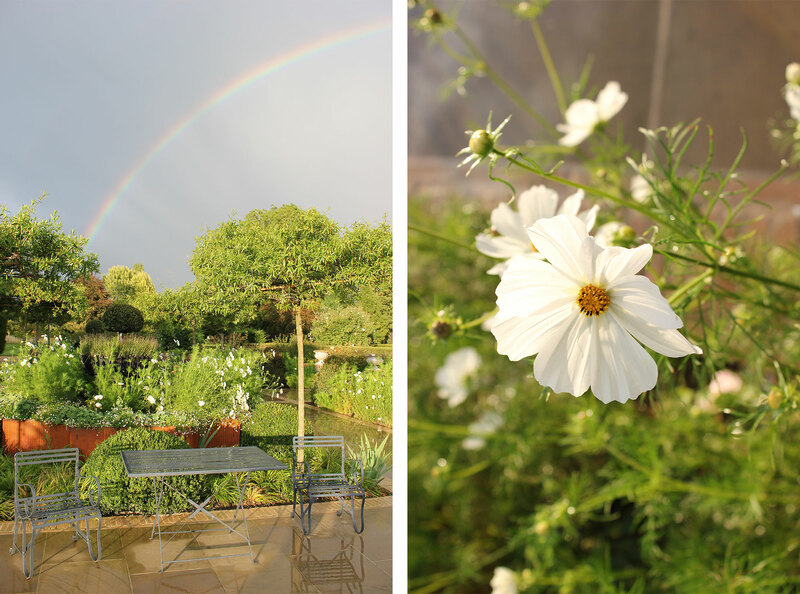 When you gaze at the perfect white flower of the annual Cosmos bipinnatus ‘Purity’ it certainly seems to encapsulate just that sense of balance and wholeness. The redesigned, re-paved and replanted large terrace on the front of the house has required over 50 new roses bought as bare-root last autumn. These were all, as originally planted over 30 years ago, fragrant David Austin roses in shades of white, cream and pale pinks. Beauties such as Abraham d’Arby, Gentle Hermione and Sceptre’d Isle, to name a few, have been slowly trying to establish themselves over the last few months. We knew the beds might look a little gappy until the new roses bulked out so we planted small plugs of Cosmos ‘Purity’ in May to fill the voids. They have certainly done this and then some! The overall effect is wonderfully abundant but all was out of kilter, with the new roses disappearing under a mass of white Triffids. We have been regularly cutting back the Cosmos to give the roses some room and air. It’s not only that the roses have been swamped for space and light to grow but it makes them much more prone to powdery mildew and other fungal disease. These C.‘Purity’ love our chalky, alkaline soil and have grown up to 1.2m high and 60cm wide which was just a little too much. But I would hate to be without them and have already bought next years’ replacement, a packet of seeds of an altogether less thuggish version, the British-bred C. ‘Apollo White’, new on the market last year. At only 60cm high and 50cm wide I’m hoping for all the floriferous virtues of ‘Purity’ but in a less scene-grabbing performer. We only have to remember to pull up the ‘Purity’ before they set seed in Autumn otherwise next year the terrace is going to be more Greek tragedy than harmonious universe.